Comments on the NYLS "Expose"
I've been thinking a lot about photographer Jay Maisel's recent legal tussle with chiptune album Kind of Bloop's producer Andy Baio, documented in a post by Mr. Baio here. The "chip" refers to the use or emulation of old computer or video game hardware to produce the jaggedly beautiful tones found in older video games, such as those on the 8-bit NES. 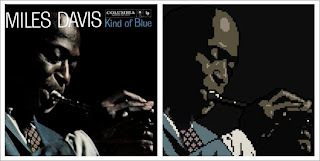 Kind of Bloop is a chiptune tribute to Miles Davis' iconic album Kind of Blue for which Baio licensed the music but failed to seek permission to use a pixelated, 8-bit version of Maisel's cover photograph.